The hut of the pearl divers is more modern than I’d expected. Here, in the village of Osatsu along the craggy coast of the Ise-Shima region in Mie Prefecture, the small concrete building named Hachimankamado blends in with its 21st-century surroundings. But inside the hut the traditions are age-old, as a group of Japan’s storied ama (women divers) prepare food, share stories and warm their bodies before a dip in the sea. Reiko Nomura, the hut’s outgoing and vibrant 80-year-old host, welcomes us in with a smile and wave of her hand. We sit, myself and my guide Tatsuya Sato, arranging ourselves to face the burning embers of the hut’s fire pit. 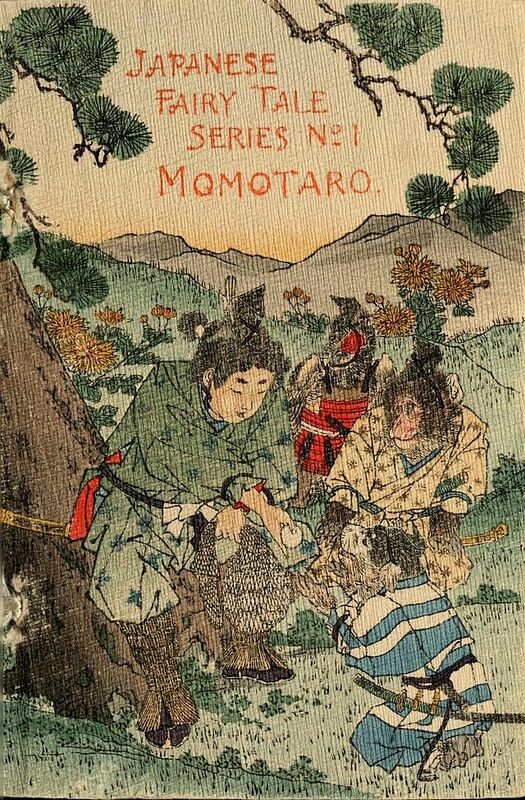 Nomura offers us tea and starts chatting away, the stories of her craft bubbling forth practically unbidden. No one really taught Nomura how to become a kachido ama, a woman who dives for abalone and other sea creatures by swimming out from the seashore with a basket and a weighted belt. As a child growing up around the culture of the ama, or ama-san as they are respectfully known, she spent her days with her mother in the divers’ huts and eventually just got into the water and started swimming. From the age of 10 until just a few years ago, most of Nomura’s life was spent beneath the waves. Before the advent of wet suits, it wasn’t an easy life, either. Nomura still sports the traditional white uniform of the ama — the color allegedly keeps away the sharks — when she meets with visitors. The fabric isn’t overly thin but it seems no match for the chill of the ocean. In the past, ama would dive twice a day, for 30-40 minutes in the morning and again in the afternoon. In the interim, they’d gather in the smoky huts to feast, gossip and attempt to bring feeling back to their extremities. When wet suits became fashionable, they’d extend their dives to an hour and a half or two hours at a time, but the communal gathering at the huts remained. 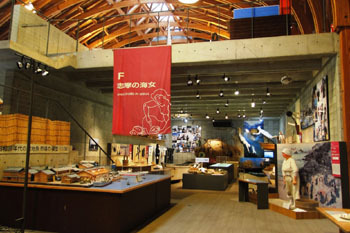 Tales from the deep: The ama display at the Toba Sea-Folk Life Museum. 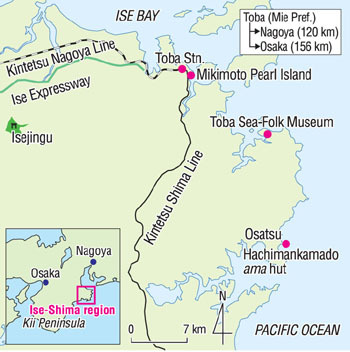 Though the Mikimoto Pearl Island museum is just up the coast in Toba, it wasn’t the glint from an oyster’s shell that drew these women to the sea. 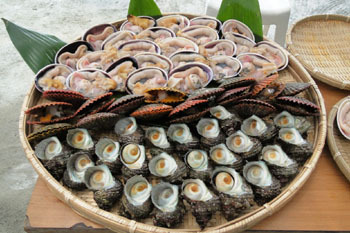 The prize catch for most ama is still the local abalone, with clams, snails and sea urchin thrown in the mix depending on the season. A fellow ama cooks up a few of these delicacies for us on an open fire in the middle of the hut. When Nomura delivers them to my plate, the clams are still bubbling in their own juices. I tackle the sazai first — a chewy snail that was caught just offshore. It’s good, but doesn’t melt in your mouth like the ōsara, a meaty bivalve that I could have gladly eaten in bushels. I’m curious to see if Nomura would mind demonstrating the isobue, the piercing exhalation of breath after a dive that’s been termed “the sea whistle.” She can’t, she concedes, and explains it’s because her busy schedule prevents her from diving anymore. Instead, she calls in Mitsue Okano, a middle-aged ama with greater lung capacity who still heads out into the sea every day. Okano gladly voices the low-pitched whistle, and I’m struck by its relation to the mournful blast of a foghorn. 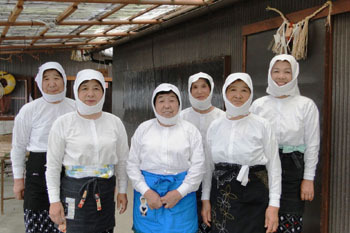 The women of ama hut Hachimankamado in Osatsu, Mie Prefecture (Nomura standing in the center) welcome visitors by appointment with stories and a meal. I can’t help but ask the standard question: Has Nomura seen the James Bond movie “You Only Live Twice,” which featured a brief scene of an ama emerging from the waves? They didn’t have much else until the electricity lines arrived 50 years ago. Nomura recalls her family’s first refrigerator and mentions several times how they longed for a TV. 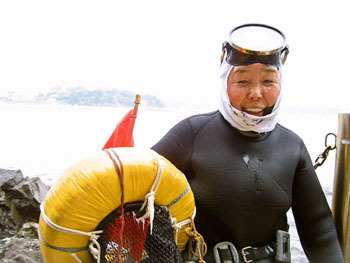 It might give the appearance of a sheltered life, but Nomura and many of her diving colleagues are well-traveled. She regales me with stories of trips around Japan, from Okinawa to Hokkaido and back again, and excitedly describes a cross-Canada train journey, just one of her many international adventures. “What would you be if you weren’t an ama?” I ask, imagining a career that would take her around the globe. “A schoolteacher,” she answers immediately, and laughs at my surprise. Her older sister ended up in a similar position, and Nomura believes she could have followed in her footsteps. Nomura’s own daughters, however, have abandoned their mother’s profession, preferring the pull of the city to the hard life of a diver. “They used to watch me shiver by the hut fire, trying to warm up between dives,” she explains. It wasn’t one of the profession’s more glamorous perks, and by the time Osatsu women started using wet suits, there was no chance for her daughters to reconsider. 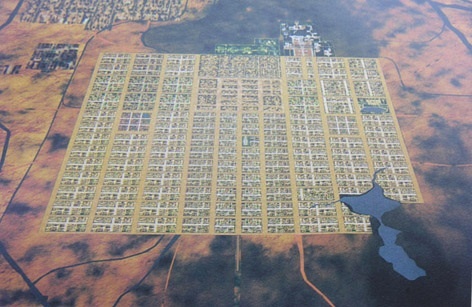 They were already long gone for Osaka, along with many of the region’s younger generation. 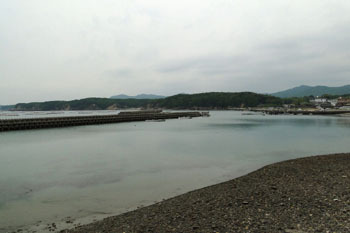 Ise-Shima might still have the largest population of ama in Japan, at around 1,000 divers, but it’s a far cry from the 6,000 or so who used to ply the waters here during the early Showa Era, from 1926 till around the start of World War II. Outside Hachimankamado, we pose for pictures with all of the hut’s ama, and Nomura offers me the chance to blend in a bit more with the crowd. As soon as I nod my approval, I’m swathed in a white diving costume from head to waist. A long-sleeve shirt is tied tightly at my wrists, while my legs are encased in a thick patterned apron. Diver Okano wraps the snowy cloth around my head, bonnet-style, though I notice my “costume” has no symbol of protection. Normally, ama wear a star (seiman) or cross-hatch (doman) design just over their forehead to safeguard them from evil spirits and ill fortune. When I point out to Nomura that my headgear is curiously blank, she assures me the charms are only for those who are actually diving. Apparently, while I may be dressing the part, there’s (thankfully) no expectation that I’ll be seeing any action! Up the road, I beef up my ama knowledge even more with a visit to the Toba Sea-Folk Museum. Sato, a former museum employee himself, steers me first to the video of a funado ama. Unlike Nomura and her hut members who swim out into the waves unassisted, funado ama dive from boats anchored farther offshore, usually manned by their capable fisherman husbands. Armed with a knife and a 20 kg weight on a rope, they descend to depths of 15-20 meters in search of abalone and other shellfish. When their breath runs out, a tug on the rope brings them quickly to the surface to deposit their catch. A reconstructed ama hut shows what a young Nomura might have played in as a child: round wooden walls, blackened from the smoke of the cooking fore, a hole in the roof thatch for the fumes to escape and a collection of hand-woven nets draped in a corner. Nearby, a display of lethal-looking implements highlights the various tools needed in the underwater world: A flat blade might suffice for slicing an abalone off of a rock, while hooks and handled baskets are more effective when the prize is sea urchin. Downstairs, a collection of ancient tools testifies to the long history of these sea women. While the first written mention of women divers in Japan was on a scroll from the year 927, the bone knives and other accoutrements found on the nearby sea floor and in the shoals have been carbon-dated as far back as 3,000 years. Whether the harvesting methods were the same or not is unclear, Sato concedes. If true, however, it would make ama one of the oldest professions for women in Japanese history. And while old methods are dying out at a rapid-fire pace in our modern world, thanks to the dedication of Nomura and her fellow divers, perhaps this is one tradition that’s here to stay. To visit with the ama of Osatsu, make a reservation through their website at http://www.amakoya.com and click on the English link at the bottom. Options include either a one-hour “tea time” with a small snack or a 90-minute lunch course. No English is spoken at the huts, but a tour guide/interpreter can be arranged. To reach the Toba area, take the Kintetsu Nagoya Line’s limited express train from Kintetsu-Nagoya Station (¥2,950, 99 minutes) to Toba Station. Change in Toba for the Kuzaki Line bus operated by Sanco to Adakoguchi bus stop (¥600, about 40 minutes). The Toba Sea-Folk Life Museum (¥800; open daily 9 a.m.-5 p.m.; http://www.umihaku.com/past_event/english/index_english.html) is between Toba and Osatsu and can also be reached by bus from Toba Station; head for Umi no Hakubutsukan Higashi bus stop (weekdays) or Umi no Hakubutsukan Mae bus stop (weekends) (¥500, about 35 minutes). 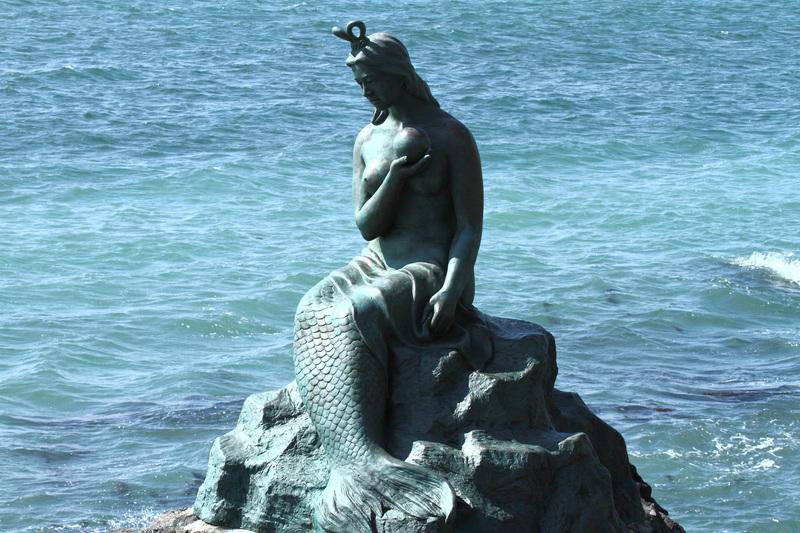 For more information on sightseeing in Mie and Toba related to ama divers, see this page “Mie and Toba: Ama divers“.